Upon selecting the ‘Mobile Banking’ option, customers would be prompted to key in their mobile number to the system, after which the system will automatically enroll them for SMS/USSD Banking and push a PIN to the designated mobile number.If the customer is an existing Mobile banking user, a new PIN would be presented instantly via SMS. The customer can access the account instantly through the mobile. This facility is also available for Commercial Bank’s ‘Dotcom’ account holders. The most subscribed to online payment portal in the country, Commercial Bank’s Online Banking platform facilitates customer convenience through a diverse range of fund management options for both retail and business customers. The retail online banking platform offers an exceptional range of features such as fund transfers across a variety of accounts, cross-currency transactions on real time basis, and bill payments to over 65 institutions,for telephone, electricity, water, credit cards, insurance premiums, educational services, sports and recreation and purchase of air tickets. The portal also allows customers to apply online for facilities such as personal and housing loans, fixed deposits and investing in treasury bills and to effect share trading payments. 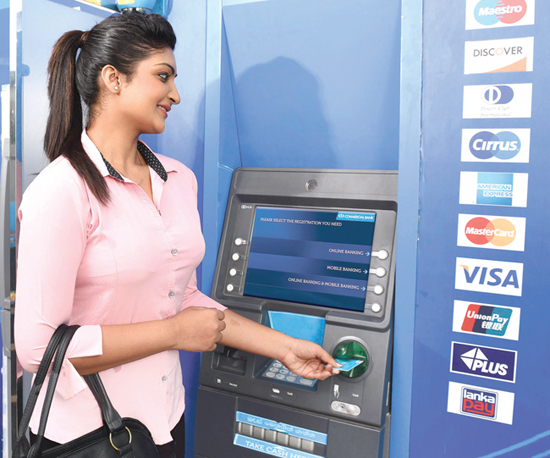 The sophisticated corporate online payment platform of Commercial Bank enables corporates to effect virtually all payments ranging from employees salaries, statutory payments such as EPF and ETF, commissions, interest and insurance payments, dividend payments, bulk utility payments and duty payments to Sri Lanka Customs. The platform is equipped with sophisticated features to facilitate delegation of authority with single, dual and multi-level authorisation and appointment of a company administrator.